Resident names used in this case study have been changed to protect their identities. Team members present were Castle, Lurch, and Colton Thomas. The Nelson family has lived in their home for approximately five years. The family consists of Mark, and Nikki Nelson. The family has four sons, Tommy being particularly important to this case. Nikki and Mark can best be described as agnostic. They believe there is something more to this life, but don’t subscribe to any particular belief system. They describe themselves as spiritual, and do their best to do what they feel is good, and right. During the summer of 2013 the Nelson home was burglarized. Because of the burglary the Nelson’s have installed a closed circuit camera system in their home with several cameras. The camera in the master bedroom, and in the living room are of particular importance to this case. Nikki has reported on several occasions the cameras in the master bedroom and the living room have been inexplicably moved and pointed at the ceiling. It should be noted the living room has vaulted ceilings and that camera is approximately 12-14 feet off the ground. It would be difficult to move this camera. The cameras have been moved within moments of each other, and while only Nikki is home. Mark reported he has awoken on two occasions at night with a pressure on his chest, and feeling like he was being choked so he could not breathe. Mark advised he ran to the bathroom. The choking sensation was bad enough he had to vomit. Nikki reported scratching and knocking from inside the walls. Nikki also described while pregnant with Tommy she and Mark were awoken in the middle of the night with a black shadowy figure standing over her. Mark reported seeing the figure as well. Both Nikki and Mark described this encounter as terrifying. Speaking with Mark and Nikki both have had similar disturbing paranormal experiences over the years. Prior to investigating the residence, WISPS Medium Brandy Paice, examined pictures of the home provided by the Nelson family, along with video footage of the cameras moving on their own. Brandy reported seeing a male spirit, a spirit of a female child, and what Brandy felt was a demonic spirit inside the home. Brandy advised the demonic spirit appeared to be attached to one child in particular, Tommy. It was decided not to share this information with the Nelson family at that time. Once the team arrived, we were given a brief tour of the home. In the basement there was a distinctly heavy feeling. The investigators were introduced to Tommy Nelson, a 15 year old male. Tommy’ room was in the basement. On meeting Tommy he told investigators the spirit that had been bothering him was gone now, and was no longer in the home. Tommy explained he had drawn warding symbols above the doorways in his bedroom. Tommy showed us several Egyptian eyes of Horus which had been drawn in black crayon. Later research showed no link between the Eye of Horus and any sort of use for warding. It should be noted Tommy suffers from a mild mental disability making him vulnerable to manipulation from malicious external forces. I asked Tommy to tell me about the spirit. Tommy advised it was large and black and hunched over. Thomas advised prior to his warding symbols it used to bother him all the time. I asked Tommy if the spirit had ever spoken to him, and he advised it had. When pressed as to what it had said Tommy replied “Rawr!! ; but throatier.”. Speaking with Tommy all investigators got the impression he wasn’t being forthright and was merely telling investigators what he thought they wanted to hear. A picture was taken of Tommy and sent to Brandy. Brandy immediately confirmed the demonic spirit was still attached to him. The investigation began with numerous photographs and continual audio recording for EVPs. Nikki watched the camera system she had installed in her home. Approximately twenty minutes into the investigation Nikki reported seeing a translucent person walk in front of me on the cameras while in the master bedroom. Shortly after that the living room camera was moved to point at the ceiling, and the master bedroom camera was also shifted out of place on it’s own accord. Investigator Lurch began to conduct a flashlight test and was getting positive results. During the investigation Investigator C. Thomas reported seeing Tommy motioning to something unseen in his bedroom to exit out. Investigator Thomas advised this was particularly creepy. Investigator Thomas confided that it appeared Tommy was communicating with the demonic entity seen by Brandy. At the end of the investigation the home and the occupants were given blessings. All investigators present and the family noticed the heavy feeling lift. After the investigators left the home and were able to debrief there was grave concern and a consensus that Tommy was being manipulated and deceived by the demonic entity in the house into believing it was a friend. Investigators felt that Tommy was working in concert with the entity and was being dishonest with investigators in his communications in an effort to protect the entity. 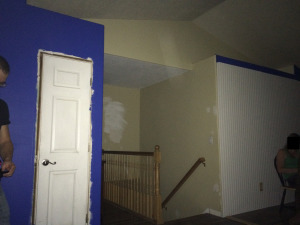 All investigators shared the common concern that although the demonic entity had been removed from the home it was highly likely that Tommy would immediately invite the demonic entity back into the home. The following day Nikki contacted WISPS and advised the entity was back, and was retaliating against the family. Nikki reported appliance and electronics failures throughout the house along with a host of other annoyances. A follow-up visit was scheduled. Concerned with Tommy inviting the entity back into the home I contacted my friend, and renowned medium and psychic Serenity Moore. Serenity has several holistic methods she uses to remove demonic dark entities from homes, and keep them out. Serenity’s methods are also more consistent with the Nelson’s belief systems. Lurch, Serenity, and I were able to use her methods and remove the entity from the home. To date there have been no further reports of problems at the Nelson home.